On a remote piece of Antarctic coast stand a couple of huts built by explorer Douglas Mawson. They are still standing after a century of blizzards in the windiest place on earth, but few will get to visit the originals. However, anyone visiting Hobart can walk through very authentic replicas ... and get a rich taste of the 'heroic era' of Antarctic exploration. The Mawson's Huts Replica Museum is more than just a couple of wooden huts. It's a living museum with displays telling the story of an eventful expedition led by Australian geologist and explorer Douglas Mawson in 1911-14. It was a scientific expedition, but apart from new knowledge it also generated a national hero and formed the basis for Australia's claims to 42% of Antarctic territory. A notable part of the expedition was Mawson's survival against the odds after his companions died on a long sledging journey. One author has described his amazing ordeal as "the greatest story of lone survival in polar exploration". This happened around the same time as the tragedy of the Scott versus Amundsen race to the south pole, and just a few years before the incredible survival of Shackleton's Antarctica-crossing team after their ship was crushed by ice. The story of Mawson's expedition is just as worthy in my opinion, but his exploits were a little overshadowed at the time by his better-known contemporaries. The displays in the enclosed verandas of the main replica hut tell the story of Mawson's expedition ... but not in a dry, museum-like way. There is text of course, but is well written and to the point. Bringing it to life are some great photos and original film footage. This was shot by the expedition's photographer Frank Hurley, whose flair for his craft earned him a spot on a Shackleton expedition. Then there are the artefacts. 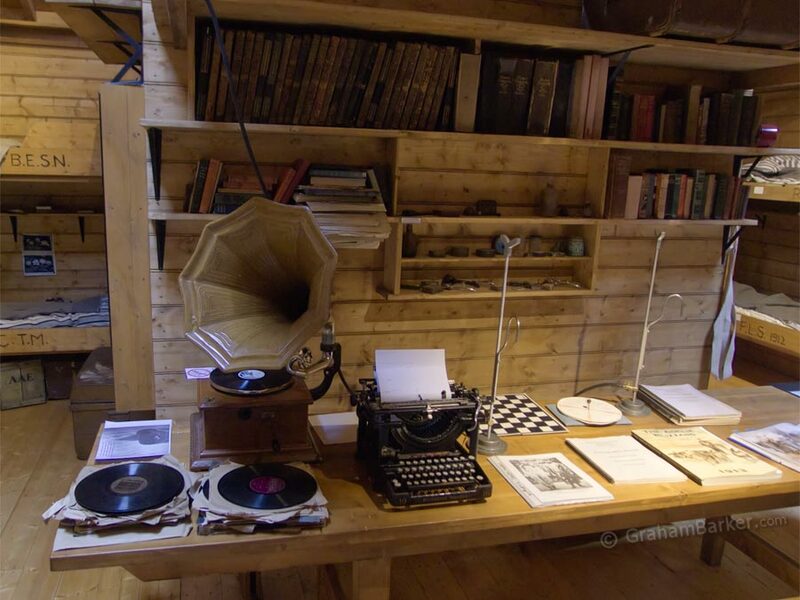 Some are actual items from the expedition, retrieved from the original huts in Antarctica ... such as a piano and a sled. Others items are identical to what they used: from the same period, just not the actual copy. Such as a record player of the same age and type, and records from that era which they took with them. Inside the main hut everything is set up to replicate the interior as it was in 1912. The attention to detail is impressive. Shelves, cupboards, beds and walls are stocked with items that were present in the hut. 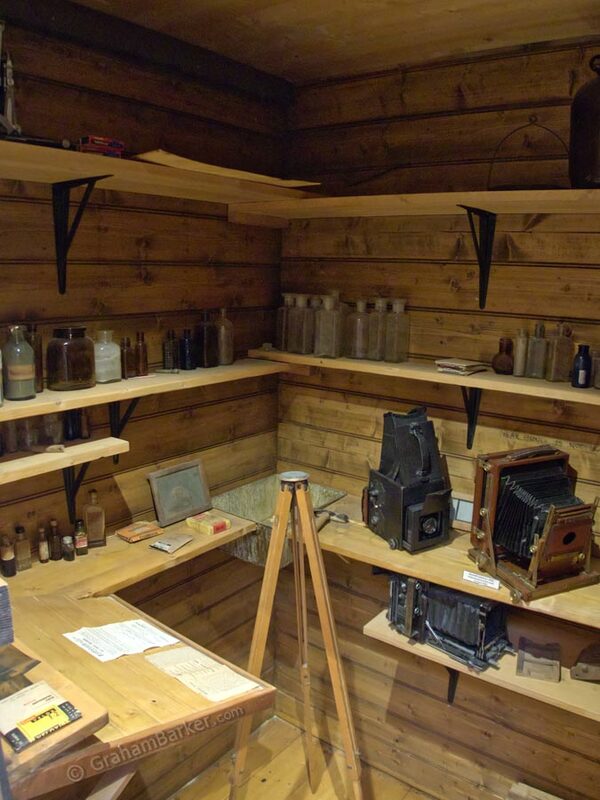 This includes tools they used, and the tiny darkroom with all the photographers equipment used by Frank Hurley. The detail extends to written notes on the walls and names and initials written on the bed frames. With the original huts still intact and undisturbed in Antarctica, modern researchers have been able to see things exactly as they were left (after clearing out the accumulated snow), rather than rely on notes or photos. This makes the replica huts genuinely true to life. One of the details about authenticity I found impressive was the hut itself. Not just identical in size and design, but also in the wood used ... the same type of wood, sourced from the same Scandinavian forest and cut in the same mill as that used by Mawson. When they use the word "replica" they really mean it. 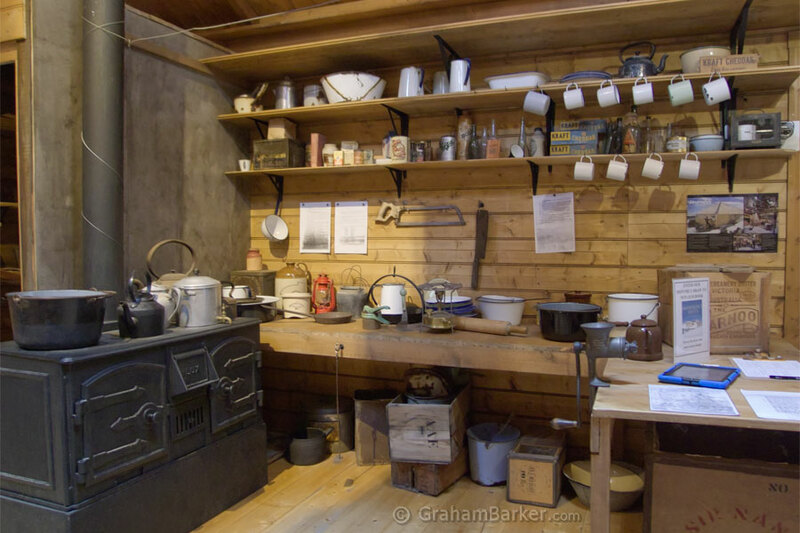 The replica museum is staffed by volunteers who support the work of the Mawson's Huts Foundation. All are knowledgeable and passionate; some have even visited the original huts in Antarctica to work on restoring and protecting our Antarctic heritage. Questions are welcomed. I first read about Mawson's expedition as a teenager, when I was somehow able to borrow an original 1915 first edition of "Home of the Blizzard" by Douglas Mawson. It captivated me and stirred a keen interest in Antarctic exploration. Since then I've read about most expeditions of that era. For me, visiting the Mawson's Huts Replica Museum was fantastic. 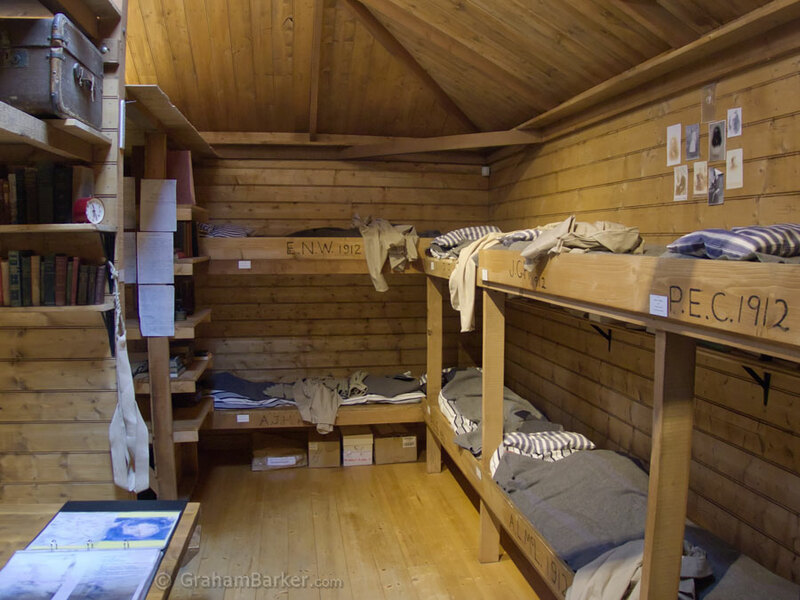 Having read so much of what took place in Mawson's huts, it was amazing to be inside the replica. To sit at the table and imagine mealtimes, to sit on a bunk bed and see what the occupant would have seen upon waking. I was already impressed with the photos and film Frank Hurley produced; to see into the teeny weeny darkroom where he worked in such frigid and cramped conditions took my appreciation to another level. The only thing lacking was the "fragrance" that would come from 18 hard-working men who seldom had an opportunity to wash, and who lived in cramped proximity around a stove which cooked seal and penguin blubber. Perhaps we should be grateful that we don't yet have the technology to replicate smells. Someone with an interest in the Mawson expedition or Antarctic history in general could easily spend two hours here, as I did. Even without that prior interest, the huts are worth visiting as an example of a historical museum done well. 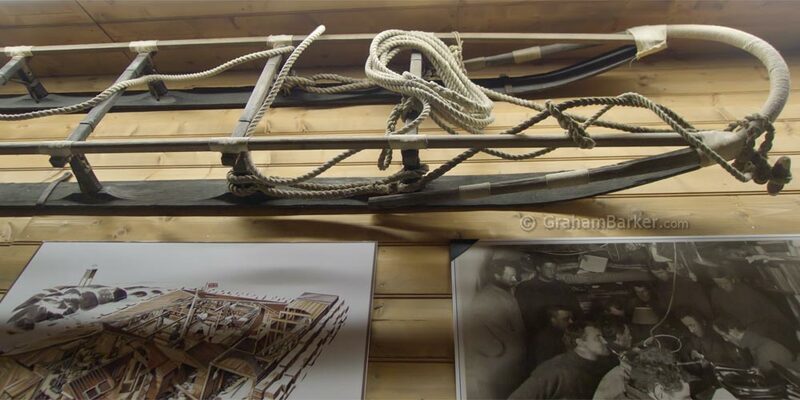 The displays and artefacts bring to life an important piece of Australia's Antarctic heritage, as do the volunteer staff if you get them talking. 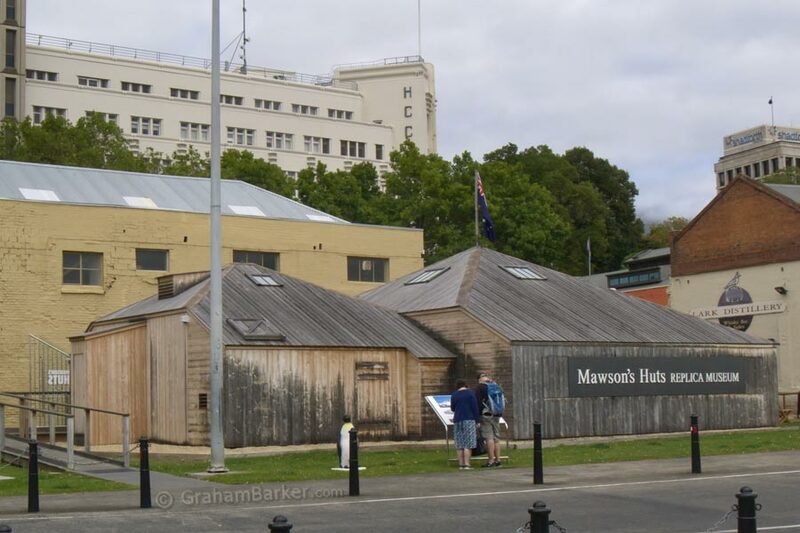 Mawson's Huts Replica Museum is located quite appropriately in Mawson Place, Hobart - opposite Constitution Dock and just a few hundred metres from where the expedition sailed from. It's open daily and fees apply, which help towards restoration of the original huts.